You hear it all the time, a phrase that epitomizes what fishing on the road system for king salmon has become. It is a joyous exclamation, but at the same time it’s sort of sad: “I caught my king!” One king. Maybe the fish was caught after several trips, or perhaps some angler had a lucky first day out. Either way, it is depressing to me. 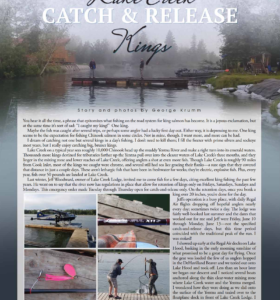 One king seems to be the expectation for fishing Chinook salmon in some circles. Not in mine, though. I want more, and more can be had.